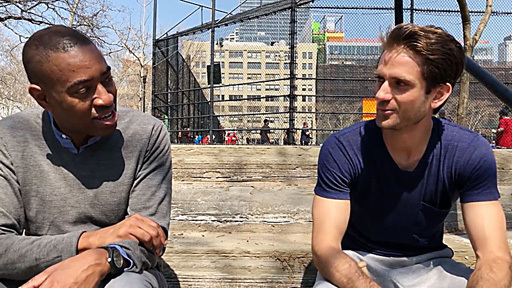 The Randy Report: '50/20' - "An Interracial, Age Challenged, Sexually Fluid Web Series"
'50/20' - "An Interracial, Age Challenged, Sexually Fluid Web Series"
Christopher Long and Christopher Nester in "50/20"
In the new series, written by Christopher Long and Evan Wynkoop, John (Christopher Nester) and Chris (Christopher Long) meet by chance on a baseball field and an accidental conversation becomes a romantic moment. Chris is an African-American man in his 50s with a great job, great apartment, great friends, but not-so-great love life. Two years after the death of his longtime lover, he’s been on a lot of bad dates. John is a good-looking guy in his 20s trying to find a career. A college graduate, he’s in that New York City “table-waiting, bartending, personal training” mode. Neither of the two were looking for anything when they met, but the conversation leads to John asking for Chris’s phone number. Plus, according to the digital series’ official website, Chris has never dated a white person and John has never dated anyone who wasn’t white. Did I mention that Chris is gay and John is straight? Check out episode one, “Chance Meeting,” below.